A new facility at Cranfield University that will enable bespoke and real-time online tutorials has been officially opened by distinguished University alumnus, Grenville Turner. 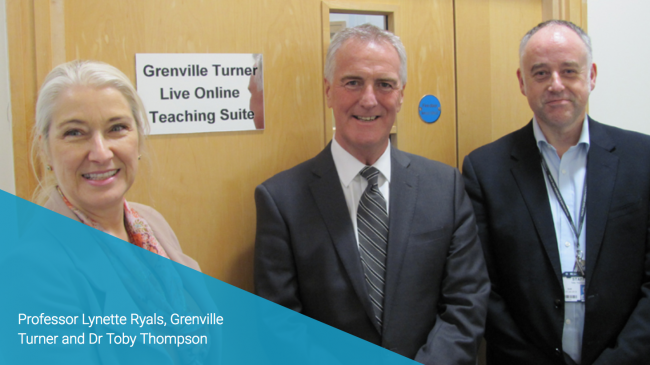 The Grenville Turner Online Suite hosts a green screen studio, a webinar studio and a hi-tech control gallery which will allow academics to deliver teaching programmes entirely online. The innovative facility is already being used to deliver the postgraduate engineering apprenticeship programme, which Cranfield has developed in partnership with BAE Systems. The teaching framework combines immediate interactions with faculty experts and remote online learning platforms, enabling staff from across the UK to access learning in a more flexible way. Grenville Turner was the recipient of the Distinguished Alumni Award in 2016 and is a keen supporter of Cranfield University. He completed his Executive MBA in 1992 and has worked in the retail banking and property sectors for over 40 years. Professor Lynette Ryals, Pro Vice Chancellor (Education) and Director of Cranfield School of Management, said: “Grenville is a great supporter of Cranfield and we are extremely grateful for his generous contribution.